It's a new cutting-edge interchangeable lens LUMIX G X VARIO PZ 45-175mm/F4.0-5.6 ASPH./POWER O.I.S. 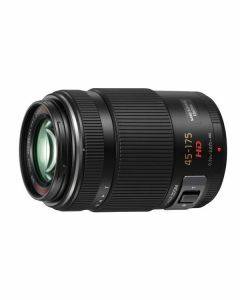 (H-PS45175) with electric-powered zoom operation from the new premium lens brand “X” for LUMIX G Micro System that complies with Micro Four Thirds System standard. Crystallizing Panasonic's optical technologies, new premium lens brand “X” features superb image rendering for lifelike textures, crisp edge-to-edge contrast, a unique Nano Surface Coating for minimal ghosts and flaring and natural atmospheres with remarkable transparency. The industry’s first adoption of Multi-Actuator Floating Inner Focus System which controls 3 lens groups separately by the individual actuator achieves downsizing in both size and weight. It also achieves high descriptive performance for resolution and contrast at entire zoom range 45-175mm (35mm camera equivalent: 90-350mm) without changing the overall length.In addition, the lens system features the inclusion of 2 ED lenses, which suppress chromatic aberration, contributing to high descriptive performance at entire zoom range. Adopting an inner focus system driven by a stepping motor, the superior optical design realizes outstanding smoothness to support the Light Speed AF of approx. 0.15 second. By speeding up the aperture control, shutter time lag is also shortened by approx. 20% compared with the LUMIX G VARIO 45-200mm /F4.0-5.6/MEGA O.I.S.